My friend got a contract to work in Singapore and thus and so off they went. 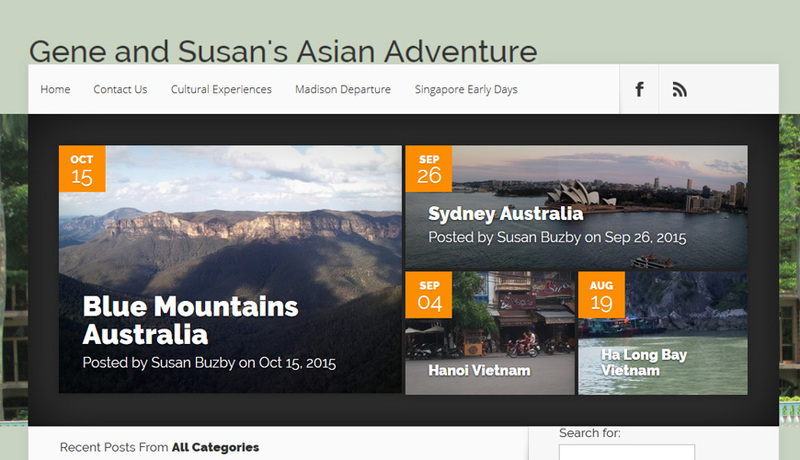 Gene and Susan decided to document their adventure using a blog. Naturally, I confirmed that this was a great idea. This was supposed to be a WordPress.com website. What’s the difference? WordPress.org websites are self hosted (you have to pay for a web host and maintain it yourself) whereas a WordPress.com site is hosted by WordPress with no maintenance required but the themes and features are limited. My friends are design sensitive and did not find a WordPress.com theme that well represented them so I decided to host a WordPress.org blog for them on debwork.com. Unlike a lot of designers, I do not resell hosting to my clients. For one thing, reselling does not save them money. More importantly, it also ties clients to my services making it uncomfortable to split if another webmaster is desired. It is my policy to not be a burden if a client wants to move on to use someone else. Admittedly, this has rarely happened but when it has, it is all very civilized. Client since 2014, friends since – 1990’s!